For many years, Great Wave has followed the tradition of lighting a long stick of incense prior to each period of zazen. As of this month, however, we have begun to burn only one stick per evening (or one stick per block of sitting periods during retreats). In the near future, we will also begin to use reduced-smoke and/or “smokeless” incense sticks exclusively. As well as being shorter than normal, these sticks contain a higher quantity of charcoal–which means they burn at a higher temperature and produce up to 70% less smoke. Zen is cool all by itself, of course, but now the zendo is cool–with air conditioning! So if global warming has increased your suffering this summer, find relief at Great Wave. 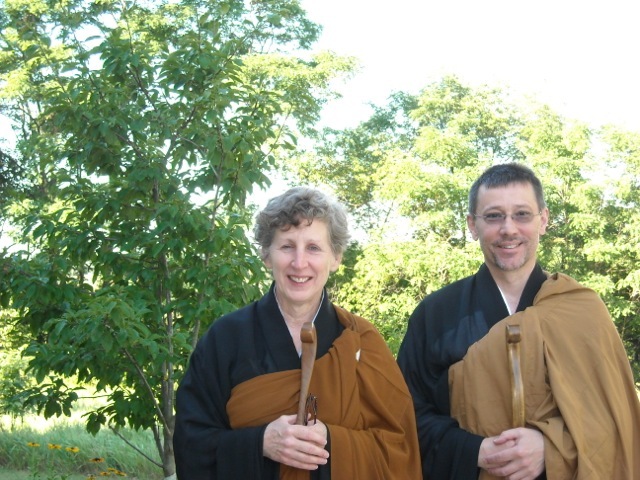 During the night of June 14th, 2012, Susan Myoyu Andersen, Roshi, abbot of the Great Plains Zen Center, Myoshinji (Subtle Mind Temple), transmitted the Dharma to Great Wave’s resident priest, Gendo John Wolff. The private ceremony was witnessed by Anne Seisen Saunders, Roshi, of the Sweetwater Zen Center in National City, California. Below you willl find Susan Myoyu Andersen Roshi‘s article on the event as it appeared in the most recent newsletter of the Great Plains Zen Center. On the evening of June 14, 2012, Gendo Sensei received Dharma transmission from Myoyu Roshi, authorizing him as a Zen Teacher and allowing him to perform jukai (giving the precepts), tokudo (ordination of a monk or nun), weddings, funerals and other functions of a full priest. In the Zen tradition, a practitioner must be given direct face-to-face transmission before he or she is allowed to become a teacher. This precious and powerful ceremony affirms and protects the depth, clarity and authenticity of our practice and assures that the title of Zen Teacher is not conferred casually or worse yet, self-appointed. The event of a new Dharma successor is a very significant milestone for Great Plains Zen Center. Seisen Roshi from Sweetwater Zen Center, located in National City, California witnessed the ceremony and was the Guest Precept Instructor. Gendo Sensei will now be eligible to become a member of the White Plum Asanga, an affinity group of Maezumi Roshi’s Dharma descendants. Gendo Sensei has been studying Buddhism since 1977. He received jukai from Dennis Genpo Merzel, Roshi, in August of 1992 and has been studying with Myoyu Roshi since 2001. He leads the Great Wave Zen Sangha in Ludington, Michigan. Gendo teaches writing and literature courses at West Shore Community College. He has published numerous poems in a variety of magazines and in the anthology Beneath a Single Moon: The Legacy of Buddhism in American Poetry. He is the author of the forthcoming book, The Driftwood Shrine: Zen Essays on American Poetry, a collection of Dharma talks based on the works of several American poets. Gendo is married to Tandy Hoen Sturgeon, and the father of Ben, Jordan, and Jessamyn.